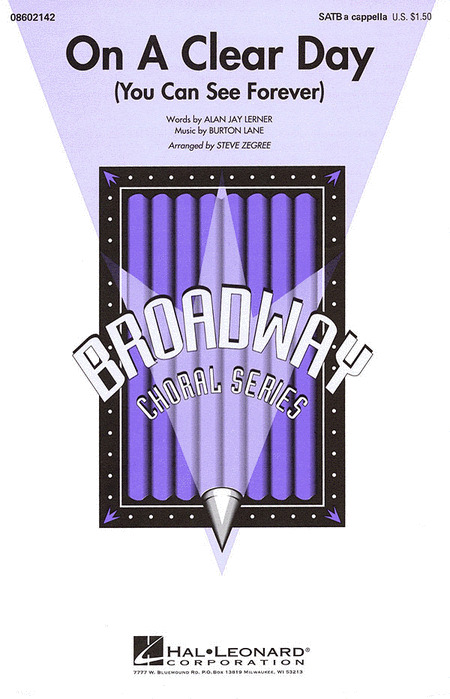 Here's a stunningly beautiful arrangement of the classic Broadway ballad. Steve Zegree's a cappella jazz voicings are breathtaking! There's nothing more fun to sing than a great show tune! An inspired a cappella treatment of the "Fats" Waller classic "Ain't Misbehavin'". Many fun options in the center section - "Rudy Vallee" solo, tap solo, etc. Totally unique! A classic Kirby Shaw setting of a Gershwin ballad " Love Is Here To Stay" is a delight. Here's a stunningly beautiful arrangement of the classic Broadway ballad "On A Clear Day". Steve Zegree's a cappella jazz voicings are breathtaking! Recorded by many artists including Tony Bennett, Frank Sinatra and Bobby Darrin, "Once Upon A Time" was featured in the Broadway production of All American. Beautiful harmonies and a lyrical melody combine to make this special.